They make many low-level chemical exposures less hazardous for workers at a very reasonable cost. ANY petrochemical worker or electrician exposed to electric arc has something in common with a meth lab cleanup team. Shawn Arbuckle of Denver's National Jewish Medical and Research Center describes the scene: "When we work in a cleanup, we don't know exactly what we'll be exposed to, but we do know the potential is there for fire and chemical exposure." Ethanol, acids, oils, ammonia, and other chemicals are the standard issue, but fire is always a possibility. These compounds alone can cause injury or add hydrocarbon loading to your flame resistant (FR) clothing, making it less effective or rendering it totally ineffective in providing protection. Arbuckle has been using Pyrolon CRFR, a coated cellulosic FR material from Precision Fabrics, and is pleased. 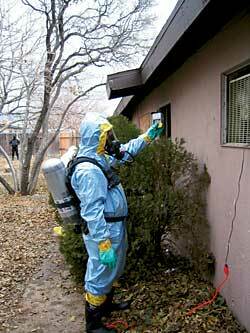 He had issues, however, finding the right suit for chemical exposure and possible flame potentials. Most chemical suits and most disposable suits are not FR. Even some that claim to meet flame tests are made of melting materials that, even in low-level flame exposure, can melt onto a worker. The hazmat team, the electrician in a petrochemical plant, and a meatpacking company electrician all have something in common: hydrocarbon loading potential on their clothing. When FR clothing has substantial hydrocarbon loading (read: hydraulic oil or other fuels), ignition sources such as potential flash fires or electric arcs can make an FR garment less effective. In this type of situation, the worker must be cognizant of his or her surroundings and use PPE made for those types of exposures. Disposable FR garments are often the best solution for use over the FR daily wear. Disposables have improved significantly from the first polyester spun-laced throw-away garments that changed the chemical protection world just a decade ago. Those garments were resistant to many chemicals but were not adequate if a flash fire or electric arc ensued. They did and do make many low-level chemical exposures less hazardous for workers at a very reasonable cost. Newer coated and sealed seam garments on the chemical protection side have made even higher-level exposures, including chemical warfare, a less likely scenario. However, the flame resistant side of the equation is still fraught with misunderstanding, especially in disposable garments. In 1994, the first arc- and flame-resistant raingear was developed. A difficult battle was fought to get folks out of "FR" labeled garments that passed small-scale tests but would melt onto workers in a 2- to 3-second flash fire exposure or electric arc event. This campaign was very successful. Now, another industry has a similar need. There are chemical-resistant garments that are flame resistant and have been flash fire and arc tested, but many garments are on the market that should not be used in a flame or arc exposure. How can you tell the difference? 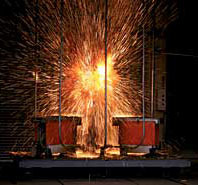 Any material that melts and drips in electric arc or flash fire should not be used even in low-risk potentials. The NFPA 70E standard requires that no melting materials be worn by a worker in any arc potential. Shouldn't this same interpretation be used in potential flame exposures? The most effective way to clarity this misunderstanding is to provide education to the market and standardization around this educated demand in the market. Cleaning up potentially hazardous materials is often part of the job. In electrical work, it could be oil containing small amounts of PCBs. This oil could also add hydrocarbon loading to the FR clothing. For the hazmat team cleaning up a meth lab, it could be a flammable material such as ethanol or a caustic such as ammonia. Cleaning up these materials requires a system of safety PPE that can be difficult to balance. It begs the question, "Do I need FR, or chemical protection, or both?" Market confusion about FR disposables and the meaning of some test methods is also a problem. Table 1 includes a list of the primary standards with an explanation of their proper uses. The first standard to address FR disposable garments was NFPA 2112, which added the allowance for flame-resistant disposable materials as "non-woven" materials. Some materials have been tested against this standard, but most specification writers are unaware it. In addition, the standard also has some disadvantage to the end user who wants a disposable garment. The disposable must meet a minimum body burn percentage and other tests that make the non-woven "disposable" beneficial in some jobs but less disposable from a cost perspective. With a garment to be worn over FR clothing and disposed of readily when soiled, this standard's requirements may create a garment with a lower value proposition (read: more costly). NFPA 2112 disposable garments make sense in some specific applications, particularly when the FR disposable can be worn longer or in lieu of FR clothing, such as an inexpensive coverall for a supervisor, engineer, or visitor, or as outerwear in a higher potential threat. Most FR disposable garments in the past would have been tested with a vertical flame test to differentiate them from a non-FR garment. Researchers now know this is not sufficient. This and other small-scale tests alone are inadequate to predict flash fire or arc burn protection. Full-scale tests (such as ASTM F1959 Electric Arc or ASTM F1930 Flash Fire) are best for these evaluations. Because these full-scale tests entered the scene in the mid-1990s, the small-scale tests have been seen as less predictive of performance and usually are used for quality control only. A garment that passes a vertical flame test may still be life-threatening even in medial level flash fires or electric arcs, especially if the material is a melting material. * The lighter weight materials may not meet 50 percent body burn or have a high Arc Rating, but they should be evaluated by a full-scale test method. Other FR clothing should be worn underneath the disposable unless its full-scale rating is adequate for the task. * A disposable that can be decontaminated or incinerated might be desirable in some applications. In upcoming years, industry will likely demand a disposable FR standard either from ASTM F1506, ISEA, or NFPA. Until that happens, examine the choices carefully. Look for full-scale data and evaluate the clothing system for the desired characteristics. There are FR disposable materials for full-scale chemical resistance, hydrocarbon loading, and light chemical resistance and low use. FR textile clothing replacement is available, but it is important to use all available resources to evaluate FR clothing before you buy.